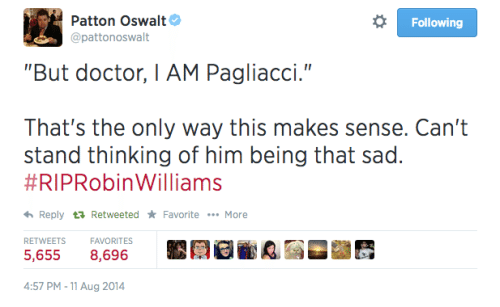 Last night Robin Williams died of depression. He was only 63, but for much of his life, like Mork from Ork, he seemingly grew younger. I grew up laughing to Robin Williams, but it is only now that it’s too late that I realize how much of what I appreciated about the man was his pathos. Yes. He was hysterical in his chemically-induced early days and even often enough in his kid-friendly later years. 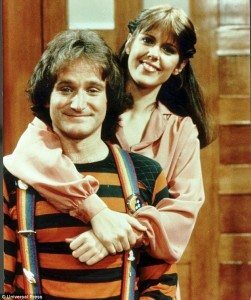 While I wasn’t a fan of his Mrs. Doubtfire stuff, and long ago stopped seeing his family comedies, I never stopped thinking of him as primarily a comedian. That’s crazy. Most of his oeuvre was material that made me feel. When his characters made me laugh, it was with present pain. Popeye. Good Morning Vietnam. Even the treacly Dead Poets Society. These are films that worked or didn’t despite Robin Williams’ impressive authenticity. He brought himself to his roles, not in a typecast fashion, but in a genuine expression of the dark comedy that rules the world. Or at least his world and mine. He took the pain he felt around him and, with comedy, transmuted that angst into active energy. When I think of Robin Williams, it will always be as Parry in The Fisher King. In that role, in Terry Gilliam’s skin-graft of a film, Williams plays a man submerged by great trauma. He is funny, yes, but also frightening in his rawness. Richard LaGravanese’s script puts this speech in Parry’s mouth. It begins with the king as a boy, having to spend the night alone in the forest to prove his courage so he can become king. Now while he is spending the night alone, he’s visited by a sacred vision. Out of the fire appears the holy grail, symbol of God’s divine grace. And a voice said to the boy, “You shall be keeper of the grail so that it may heal the hearts of men.” But the boy was blinded by greater visions of a life filled with power and glory and beauty. And in this state of radical amazement he felt for a brief moment not like a boy, but invincible, like God, so he reached into the fire to take the grail, and the grail vanished, leaving him with his hand in the fire to be terribly wounded. Now as this boy grew older, his wound grew deeper. Until one day, life for him lost its reason. He had no faith in any man, not even himself. He couldn’t love or feel loved. He was sick with experience. He began to die. How could we not know that Robin Williams was so thirsty? Looking at his career, he brings so much suffering to so many tortured characters. Bobcat Goldthwait’s little-seen dark comedy, World’s Greatest Dad, gives Robin Williams a turn as character dealing with his insufferable son’s suicide. It is as dark as comedy can be. Not a perfect film, but lacerating and unforgivingly funny. While family audiences laughed through his antics in at Night at the Museum and Happy Feet, I was pushed back in my seat by his performance in Insomnia. Robin Williams made me laugh. He made me suffer. And now he makes me appreciate what being so connected to the joy and pain of life cost him. I will keep searching for his grail. He deserves it. Until next week, sir: nanu nanu. a great loss. I’ve had World’s Greatest Dad lying around for a while. Will watch it soon. His death has made me think about depression a lot. I don’t suffer from it at all. I’m not prone to great variance in my mood as such but it made me think a lot about how despair can afflict anyone and how awful it must be to feel so alone. It made wonder if there is anyone I know suffering that I could drop a line to. Just say hello, you know?? Got a new job and moved back home recently. Been reading but not commenting. Not watched many films recently either. I was really disappointed with Noah it was so boring and lacked any kind of visual inventiveness that I would expect from Aronofsky, it just plodded along. The film was seemed to mirror the way Russel Crowe played Noah. Dawn of the Planet of the Apes was good sort of but it did nothing to surprise me, the plot and themes were really straightforward and I knew everything that was going to happen within the first 20mins. Guardians of The Galaxy was goodish. It’s not bad, it has some nice touches, it’s fun and super lightweight. The bad guys were a major weak point for me. Hello. Yes. Drop those lines. People who are depressed may well appreciate being thought of, and feeling as much of the balm of companionship as they can, and those that aren’t probably have jokes and stuff to tell you. I also dug Short Term 12. Wrote it up a while back but you probably saw that.